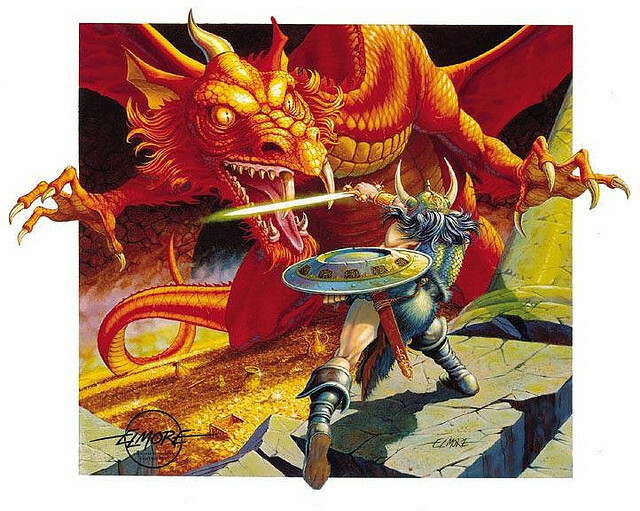 I’ve been pretty critical of Dungeons and Dragons lately. In blog posts, on message boards, in heated discussions with friends. I played DnD almost exclusively for twenty years. I ran a Dragonlance campaign that spanned four of those and a homebrew campaign that ran over a decade. ADnD, second edition, and finally ending with 3.5. I tweaked rules, tossed out annoying ones, made on-the-fly decisions to keep games running. Eventually, I hit a wall. Rules fatigue set in. I tried for months to craft my own version of a system I’d first bought as a kid doing door-to-door sales to earn the red-box Basic set. Pathfinder, for me, fixed many of the issues I had with 3.5 but introduced a new set of problems. I wanted something cleaner. Classes? So passe. Attribute checks? Saving Throws? Seriously, pick one. Pages and pages of spells with increasingly complicated descriptions? Too much. Alignments? C’mon. But all the way home from my gaming session, I kept coming back to one thing – I had missed it. Twelve players crowded the table. Ages ranged from tweens to some that had a few years even on me. Many of the younger kids were there with their parents – a new generation brought in by the old. All of them were there to craft a story. Watching the cleric huddled over her player’s handbook, flipping through those overly complicated spells with a sense of wonder and discovery. The party waiting with baited breath to see how the paladin (me) would react when my Detect Evil caught an aura of some strange symbiotic artifact attached to the sorceress’ arm. Feeling for the DM as he juggled a dozen players all running separate directions around the city like kids on a playground. It was messy. Crazy. Hectic. And damn fun. Sure, call it nostalgia. One of the players even felt the need to tell me “you came on a good night.” (I know what those bad nights at the gaming table are like.) But that diverse group, veteran players and new. Young and old. Everyone sharing a make believe world and making the story distinctively theirs. Somehow that clunky rules system provided the glue for a fantastical experience. It’s where I came from. Where my own narrative began. It embodies what I want to do with my fiction – speaking to the old souls and young at heart. It was a joy to go back and see others getting so excited about a hobby that transcends all the “fixes” that have been applied over the years. Previous PostCoffee with Joe HaldemanNext PostWhere Have All the Readers Gone?